Southwest Traditions is an online gallery which springs from the love of two people for our friends at the Hopi, Acoma, and Zuni Pueblos and their traditions. 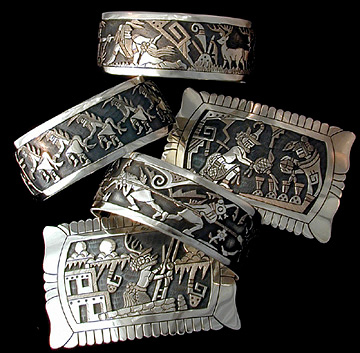 More than 30 years ago we were introduced to Hopi silver overlay jewelry on one of our trips to the Southwestern United States. Our immediate attraction was the exquisite craftsmanship (see Hopi Jewelry) and the universal appeal of the designs. This combination allows Hopi jewelry to be worn in very formal as well as informal settings and comfortably in places other than the Southwest. The mainstay of our business had been supplying other shops and galleries with Hopi Indian jewelry. This web site provides us with an exciting new way to share with many more people, the talent of the Hopi silversmiths and the beauty of Hopi silver jewelry.